In a previous post I showed a quick demo of a PathBuilder class I created to help draw dynamic shapes. I would like to include a simple example of how to create Shape controls using the same tool. 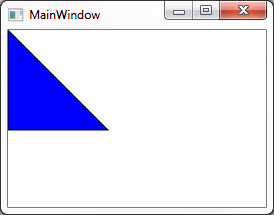 I have created a very simple Triangle control which you can download and see run. Notice I inherited from Shape and use the PathBuilder to generate a Geometry object and return it in the protected DefiningGeometry property.